Pewaukee-based V-Glass, LLC is pulling ahead in the race to perfect vacuum insulating glass technology, having just received a Small Business Innovation Research (SBIR) Phase II grant from the National Science Foundation for over $720,000. This will allow the company to make significant strides in advancing and proof-testing their innovative energy-saving window technology, with the goal of developing a product that is more efficient and less expensive than triple glazed windows. As a typical home loses 30% of its heat through windows and new Environmental Protection Agency Energy Star standards have gone into effect for residential windows in the northern region this year, affordable “windows as warm as a wall” – as the V-Glass slogan proclaims – would revolutionize the architectural industry. Since it was founded in 2008, V-Glass has been awarded grants totaling over $1,450,000 (including the current award), as well as numerous in-kind contributions of supplies, space and services. V-Glass was also the first place winner for the Advanced Manufacturing Division of the Wisconsin Governor’s Business Plan Competition in 2013. However, the company had to work very hard to achieve this level of support. SBIR grants in particular are highly sought after and the process of completing a competitive application is notoriously difficult, especially for novice entrepreneurs. According to V-Glass CEO Peter Petit, the company submitted nine SBIR applications before receiving its first successful Phase I award, and then received three more in rapid succession. Additionally, their first three Phase II applications were denied before V-Glass received the award this month. Petit has utilized the services offered by the Center for Technology Commercialization (CTC) for eight years while raising funds to advance research and development, and he largely credits that support and mentorship for his company’s success in acquiring federal funding to continue on their path of discovery. “[CTC Consultants] know the scoring pattern, and have experience and knowledge about what federal agencies are looking for and the kind of accounting system needed,” stated Petit, who has also received several commercialization-focused grants through the CTC. The Micro-Grant program connects entrepreneurs to professional assistance in writing business and commercialization plans and applications for federal SBIR and STTR (Small Business Technology Transfer) funding, and the SBIR Advance matching grant program provides funding and training for business development and commercialization activities not covered by SBIR/STTR grants. The V-Glass journey took several turns over the past five years to reach this point. Experiments on edge seals in 2011 led the company to a strategic pivot in 2012 when they began perfecting a method of directly cold-welding aluminum to glass. 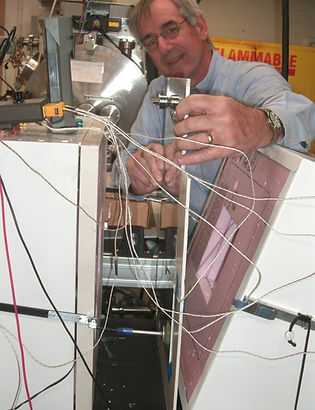 Following that, further trials led to the realization that pane-spacers were key to high performance, and V-Glass developed a new type of metal ‘whiskers’ for the task, which – while difficult to see by design – space glass panes apart with minimal contact to prevent heat loss while minimizing stresses and bowing. In 2015, while testing their first prototype utilizing this approach at the Technology Innovation Center in Wauwatosa, there was a cold snap; the V-Glass product demonstrated twice the insulating value of triple pane windows in winter conditions. This is the technology V-Glass just patented, and according to Petit it’s the most important milestone the company has reached to date and was fundamental to winning their latest SBIR award. One remaining hurdle V-Glass is working on is how to eliminate outgassing on sealed off windows, which would cause the vacuum to decay over time. This is the topic of their current Phase II proposal. Petit has also submitted a grant proposal to the Department of Energy to do further work on outgassing control. V-Glass must also complete the testing required by private investors to prove their products are ready for customers without warranty risk, which is a very expensive process.